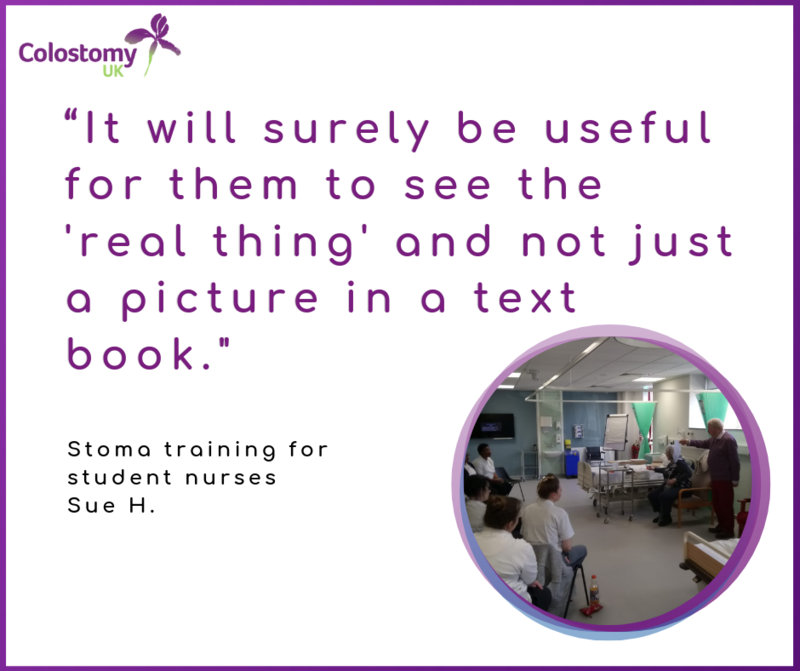 Judy Pullen, clinical nurse specialist at Great Western Hospital in Swindon asked Colostomy UK if we could find any volunteers to talk to some second year student nurses at Oxford Brookes University about living with a stoma, and the lovely Sue volunteered. “Who would have thought that at the age of 68, having had a stoma for 20 years, I would have the courage to drop my drawers, take off my stoma bag and reveal all to 35 Student nurses on 3 separate occasions! 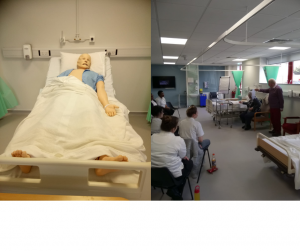 Having retired from working at what was The Colostomy Association, I hadn’t done any public speaking for a long time and was quite apprehensive, however, I felt this was an important part of a student nurse’s education and put my hand up. The lecturer in adult nursing, the delightful Julie Young had asked if the students could be given a partner/carer’s perspective and so always happy to be in the company of young nurses my husband Neil stoically agreed to accompany me. The Joel Joffe Building is a marvellous training centre for student nurses. Neil and I were ushered into a ‘ward’ with 10 beds and two dummy patients (who frankly looked terrified). Beds were moved, chairs arranged, and 30 -35 students came to listen to my stoma history. I had a Colostomy for 14 yrs before pre-cancerous polyps forced an unwanted ileostomy on me. This meant that my days of irrigating were over, but I was keen to tell the student nurses how the opportunity to irrigate is so liberating for those who can. Neil was very gallant and held up the irrigation bag! I showed the students my stoma. I have a lot of granulomas, so it was a bit bloody and not a perfect little strawberry/rosebud, but it will surely be useful for them to see the ‘real thing’ and not just a picture in a text book. Neil and I were able to answer a variety of questions in a frank and honest manner. I was unable to give the talk the following week as I had to attend a funeral, but Julie made a video of me and showed it to the students at the Monday lecture and I have since been asked to go back! It was great to be able to tell student nurses what we expect of our nursing care and the support that follows. Hopefully they were receptive and these nurses will take on board the dramatic effect having a stoma takes on all ostomates. If any of you are prepared to speak at the nursing universities – please let’s get our voices heard.” Sue H.